Upgrade your Mustang's stopping power with the ROUSH® Ford Mustang High Performance Brake Kit. 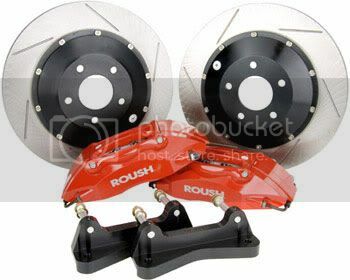 This kit fits 2005-2011 Ford Mustangs with ROUSH 18" wheels only, to maintain proper caliper clearance. The kit includes four-piston calipers with braded brake lines, front brake pads, and 14" 2-piece slotted zinc-washed front rotors. Not only will this package make your Mustang look better, it will decrease stopping distance, improve braking modulation and control under braking, improve initial bite, and dissipate and manage heat much more effectively. This kit comes standard on some of ROUSH's highest performance vehicles, including the ROUSH Stage 3 Mustang as well as the ROUSH P-51A Mustang.